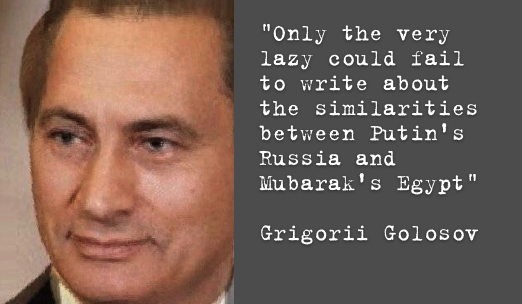 The similarities between the Egyptian and Russian regime are striking, says Grigorii Golosov. Arguably, Mubarak’s was the more liberal one. These days everyone except the very lazy is writing about the striking similarity between the political regimes of Putin’s Russia and Mubarak’s Egypt. I have no quarrel with that: the similarities are enormous. But perhaps the detail is less well known. Anwar Sadat introduced a concept of sovereign democracy in Egypt when he had fallen out with the Soviet Union and become the Arab world’s privileged US partner. Sadat’s predecessor, Nasser, had left political structures built on the Soviet model, but these were no longer right for a country that was meant to be a shop window of Middle Eastern democracy. The chief of these structures was Nasser’s Arab Socialist Union party. Initially Nasser divided this party into three “forums”: rightwing, leftwing and (mainly) centrist. These forums were permitted to compete in the experimental elections of 1976. An experiment that proved a success. In the next (1979) election there were three parties based on these “forums”. The centrists were there, but they had been renamed the National Democratic Party (NDP). This party won 347 seats; the other two won 32. The NDP success is not difficult to understand. It had inherited all the political, organisational and administrative resources from the Arab Socialist Union party. The right- and left-wingers were groups of urban intellectuals, and Egypt is a rural country. The peasants, fellaheen, knew nothing about the new opposition parties, and their candidates did not venture into the countryside or organise a campaign. So this was the successful beginning of Egypt’s “sovereign democracy”. Its main opponents at the time were radical Islamists unable to forgive Sadat for his pro-American stance and the reconciliation with Israel. In 1981, Sadat was duly assassinated. 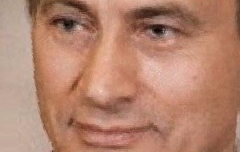 The new president was the leader of the NDP, and today’s President Mubarak. During the 30 years since then there have been parliamentary elections, and the NDP has always won. It should be stressed that these parliamentary elections were very important constitutionally speaking. Before 2005, the President was elected directly by parliament; and now only parliamentary parties can field candidates for the Presidency. So the results counted, and it was worth worrying about them. From the start, the main facilitator of Egyptian sovereign democracy was the law on political parties, passed under Sadat in 1977. This law entrusted the registration of parties to a special Commission on Political Parties (CPP), which had been set up by the president and the two chambers of Parliament. The CPP was entitled to register only those parties which conformed to the criteria enshrined in the law. All other parties were refused registration. And if a party ceased to conform, it was deprived of its registration. No party’s programme or activity was allowed to contradict the foundations of Islamic law, the “principles of the 1952 and 1971 revolutions ” and the “socialist democratic order”. For a party to be registered, the Commission had to establish that its programme was unlike any others (if its the same as what is already out there, why bother with another one?) and to establish that the party was not based on denominational, ethnic, class or religious principles. It was also strictly forbidden to set up parties that did not accept the peace settlement with Israel. "The main instruments of sovereign democracy in Egypt are the same as they are in Russia"
Under the 1977 law any party could be refused registration. And indeed they generally were: of the 62 organisations that applied to the Commission for registration, only 2 were granted it (we don’t include here the parties that succeeded the original “forums”). Fortunately for party members, however, Egypt has a relatively independent judiciary — perhaps the fundamental difference from Russia. It was set up on the French Napoleonic model as early as the 19th century, and it flourished under the monarchy. It is an object of national pride: neither Nasser or Sadat felt able to destroy it. For this reason it occasionally proved possible to appeal Commission decisions in court, and some parties were registered as a result of court orders. But it was a difficult path. Few parties succeeded, and when they did there were extenuating circumstances. On the one hand, a court order led to the legalisation of “Wafd”, the oldest Egyptian liberal party which had managed hold on to its popularity despite a 40-year ban. On the other hand, a court order also achieved registration for the “al-Umma” party of Akhmed As-Sabahi, author of a popular book of dream interpretations. The more eccentric demands of this party include the distribution of parliamentary seats equally among all registered parties, and the obligatory wearing of the fez. Currently “al-Umma” serves as a nucleus for the fictional opposition, the so-called Bloc of Opposition Parties. Russia’s has its own analogue of this party — Vladimir Zhirinovsky’s Russian “Liberal Democrat” Party (LDPR). So the party field was purged. Concurrently, attention turned to the voting system. A plurality voting system, based on single member districts, meant that independent opposition members at least had a chance of getting into Parliament. For this reason, in 1984 Egypt went over to the system of proportional representation, with a barrier which is slightly higher than the current Russian barrier of 8%. In that election the NDP won 390 seats; the remaining 58 went to “New Wafd”. At this point the Constitutional Court intervened: in 1986 it declared that any situation where independent candidates could not take part in election did not conform to the basic law. The plurality voting system was reintroduced in 1990. This had no effect on NDP election results: they maintained their huge majority. But the representation of other parties fell sharply and their place was taken by independent candidates. At the beginning, when they won at the elections, almost all of these independents joined the parliamentary party of government. This happened in Russia, too, during the mixed [plurality-proportional] electoral system. In the last decade, the situation changed with the arrival on the scene of the Muslim Brotherhood, whose candidates stood as independents. In the 2005 election they managed to win almost 20% of seats in Parliament, which was completely unexpected for the government. "The Egyptian experience is proof that an independent judiciary is no panacea. You're better off with it than without it, but it alone cannot fundamentally improve the situation"
The Egyptian government was well prepared for the 2010 election. Now that the parties no longer represented a threat, the main efforts were directed at refusing registration to as many parties as possible. In those few constituencies where they did manage to register — again, mostly after appeals to the courts — bribery and intimidation of the electorate was rife and observation of the elections almost forbidden. Most of the opposition parties consider that the results were almost universally falsified. The NDP won 420 of the 503 seats, its best result since 1984. The biggest opposition party, “New Wafd”, won just 6. In short, the main instruments of sovereign democracy in Egypt are the same as they are in Russia. Above all the repressive legislation on political parties; the Executive's control of the organisation of the election (in Egypt this is implemented by the Executive: the “independent” Supreme Electoral Commission, which is made up of judges, has no real leverage); the removal of opposition candidates from the election; and the open falsification of results. In some ways, indeed, the Egyptian regime is more liberal than the Russian one. There are currently 7 parties in Russia and unlikely to be more, but last year's election in Egypt fielded about 20 parties. The relative independence of the courts has something to do with this, of course. But the Egyptian experience is proof that an independent judiciary is no panacea. You're better off with it than without it, but it alone cannot fundamentally improve the situation. The move away from the system of proportional representation is no help to democratisation either. The root of the evil lies in the personalised dictatorship, rather than in those legal institutions that surround it.